Bunnahabhain is not a typical, heavily peated, smoke-filled Islay – instead it lets the sea and the island’s nature speak naturally. This welcoming taste embodies the approachable side of Islay. 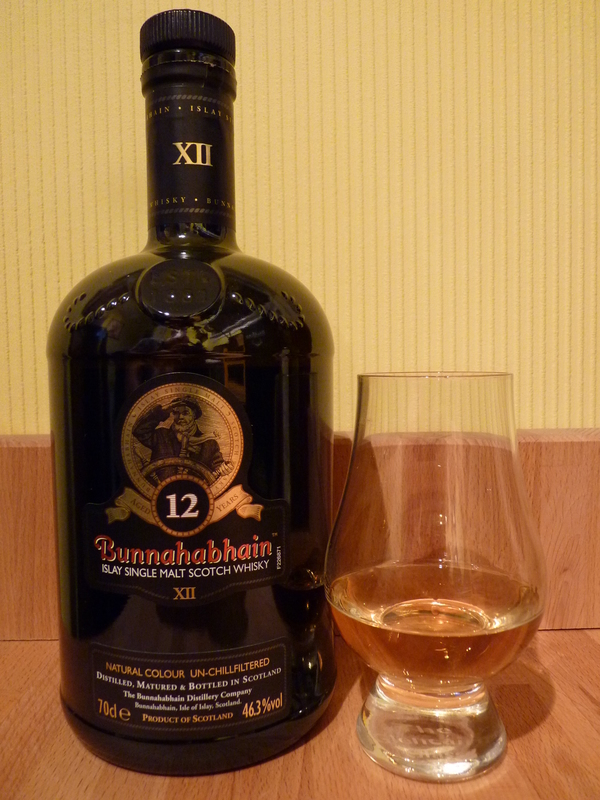 Bunnahabhain 12 year old Islay Single Malt Scotch Whisky is now being re-introduced as an unchill-filtered spirit. A move which inspired articles, and tales from whisky lovers and experts across the world. When we changed to unchill-filtered malts to allow their full character to come out, we wanted packaging that told this story. With this in mind a new smoked-oak glass that hints at our flavour has replaced the traditional emerald green of the 12 year old bottle. Additionally dual labelling now tells the tale of our overall sense of specialty, subtlety, confidence and luxury. A revised neck label has also been developed to display the product’s age. And because a good story deserves a good presentation, the bottle now sits in a quality gift carton containing a booklet with tales of the Bunnahabhain brand. I bought my first on offer from Sainsbury’s supermarket for around £26, the second bottle came via someone in the whisky retail industry for £20 – an offer I couldn’t refuse. Very enjoyable basic expression from the Bunnahabhain distillery. This is an Islay that is not like an Islay. Bunnahabhain are not unique in producing un-peated [or very very lightly peated] expressions from amongst the Islay distilleries, however it is fair to say they have a unique balance in that they are mostly non-peaty with a rare peated expression thrown in – so the opposite of most of the other distilleries. I find it fascinating to think what other Islay distillations would be like without the peat influence, though it should be borne in mind that peat influences may enter the whisky via both the water source used and the use of peat smoke to dry the malted barley. 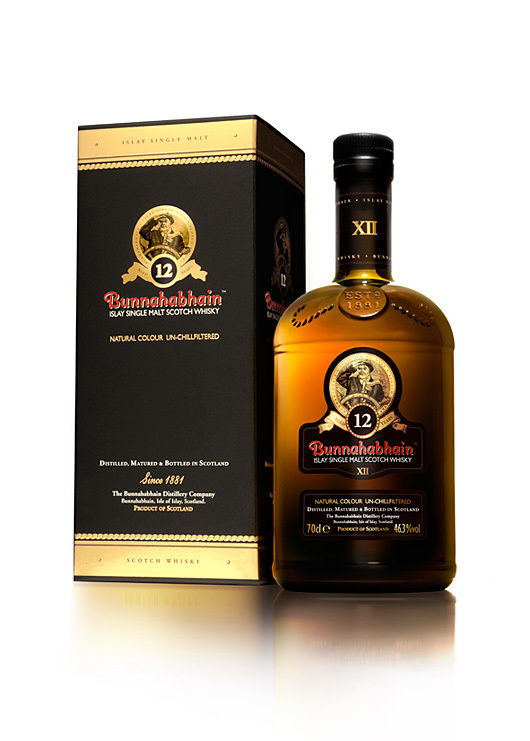 I have to admit Bunnahabhain do produce a damn good malt and I have met many many whisky drinkers who are big fans of this whisky to the point that it is their favourite. Most definitely, in fact I already have. Definitely worthwhile in anyone’s collection. The Daruch Ur, only available at airports (unless that has changed) is amazing for the price – about £30(?) for a litre. Bunnahabhain are definitely doing something right as a lot of people favour them, and some of those have tried and know a lot of whisky! The Darach Ur is very good – I have a bottle on the go at the moment and hope to review it soon. I have also tried the Bunnahabhain 18 year old recently during a trip to their sister distillery the Deanston and I can tell you it is stunning. Here’s to luck and whisky. Slainte.